For most travellers, Quito is simply a necessary stopover on their way to the Galapagos. And as one of the smaller South American capitals, it can easily become overshadowed by the European flair of Buenos Aires or culinary delights of Lima. Those that are lucky enough to spend some time in this Andean metropolis, though, know that there is much, much more to experience in Quito than first meets the eye. Here’s everything you need to know about Ecuador’s, if not South America’s, coolest city. Easily the most recognisable and well-known part of Quito, the historic centre has been miraculously well maintained over the years. A brief stroll through the Plaza Grande grants lucky visitors views of the various baroque churches, palaces, and monasteries that line the cobblestone streets. If you have the chance, the stunning Teatro National Sucre hosts various performances throughout the year ranging from local concerts to orchestras to renowned plays. And if at any point your feet get a bit tired during your trek through colonial times, feel free to hop a ride on “el gusanito,” a local caterpillar-shaped trolley that cruises the streets of the old town throughout the day. It may look like a children’s carnival ride but it’s a super affordable (plus, amusing) way to get around. In case your Spanish is a bit rusty, Ecuador quite literally translates to ‘equator,’ due to is location right over this imaginary line. The indigenous people took great meaning from this and it’s not difficult to see references to this throughout the country. The most famous of these is probably the Mitad del Mundo monument located just north of the city. While it is not the actual site of the equator, it is the representation of this and the classic spot to visit for that “I’m standing on both sides of the world” photo. On weekends there are also local vendors selling handicrafts as well as indigenous people performing dances in traditional clothing. If you want to see Quito, and we mean ALL of Quito, a trip up the TelefériQo is an absolute must. Located on the edge of the city centre, the gondola/aerial lift takes guests over 2,000 feet up to the top of Pichincha Volcano. From here you can easily see (and photograph) Quito from one end to another as well as grab some spectacular views of the Andes Range. Be sure to pack a jacket as the weather up here tends to be windy and a bit cool. There’s also some perfect trails for the avid hiker, as well as horses you can rent for a brief ride around the summit. We suggest waiting a few days after arrival to try this activity as the altitude can be a bit daunting if you aren’t adjusted. Of course there is always some cocoa tea available for purchase at the summit restaurant if you need a little relief. Aside from all the sightseeing and adventure, Quito has an amazing abundance of great restaurants and nightlight venues. The main social scene is known as La Mariscal (or as the locals jokingly call it, “gringolandia”). Here you can find a plethora of delicious restaurants including Zazu (traditional dishes with a modern twist) and Lua (a trendy but low-key eatery). And if you have the late-night munchies there’s always the Coffee Tree with its selection of the best papas fritas, cakes, and coffees in town. As far as nightlife goes, La Mariscal has just about everything you can think of, from dance bars with 150+ shot menu (Chupitos) to traditional Irish pubs with iced beer mugs (Finn McCools). If you prefer a more laid-back night out then head over to the Guapulo district. 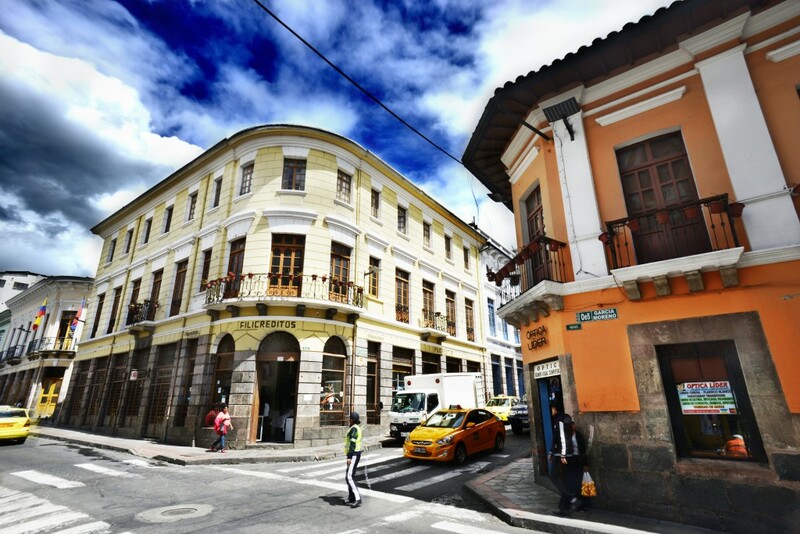 The streets here are filled with bohemian style cafes serving the strong but tasty Ecuadorian classic, canelazo. Café Arte Guapulo is a local favourite with great views over the city and stone walls coated in old concert posters. The perfect funky spot to kick back, listen to live music, and make friends with the resident cat. Mindo: Just an hour bus ride northwest of Quito. The area is technically deemed a cloud forest but in reality is a full-on adventurer’s paradise. Visitors can hike for hours on end through trails dominated by forests, waterfalls, and exotic birds only to cap off their day with zip-lining and whitewater rafting. Banos: Three hours south of Quito is Ecuador’s version of a spa town (and one of many highlights on Intrepid’s Ecuador on a Shoestring trip!). Located on the edge of Tungurahua Volcano, Banos is renowned for its volcanic thermal baths and their reputed healing powers. Of course you can still get your fill of adrenaline and have a go at “puenting” aka bridge jumping, rent an ATV for a drive up the volcano and through the waterfalls, or take a seat on the casual End Of The World swing. Otovalo: Everyone needs a good souvenir now and again so what better option than a quick (two-hour) jaunt to Otovalo, South America’s largest outdoor market? Weekends usually have the most to offer with villagers selling everything from livestock to alpaca blankets and handcrafted pottery. It’s also a great opportunity to practice your Spanish and try your luck at haggling. Cotopaxi: Last but not least is the majestic Cotopaxi, an active volcano covered in cloud forest and topped with one of the few equatorial glaciers still in existence. Most visitors are happy to spend the day hiking up the slopes or climbing to the refuge station. However, if you’re feeling the call of the mountain, you can try an overnight trek to the summit complete with ice picks and crampons.